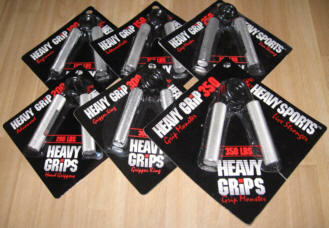 Heavy Grips Hand Grippers Is The BEST Choice For You! The Heavy Grips hand gripper series was developed for athletes who want to take the training of their grip strength to the next level. These heavy-duty hand grippers allow you to train your grip and actually gain strength using low repetitions instead of doing endless reps with plastic handled department store hand grippers. These high-quality aluminum-handled handgrippers are made in 50 pound increments from 100 pounds of tension to a whopping 350 pounds pounds of tension! So that you can train your grip similar to training any other bodypart — by increasing resistance. These grippers are not just a novelty… they really work and have helped thousands of athletes improve their game. The Heavy Grips are manufactured using high-grade aluminum for the handles, which are machine-knurled, then chromed. This allows users to get a good grip on the handles while not being too rough on their hands. Our heavy duty springs are electrophoretically coated to resist rust and surface damage. These are the perfect hand grippers for Arm Wrestlers, Powerlifters, Strongmen, Bodybuilders, Martial Artists, MMA Fighters, Tennis Players, Baseball Players, Fireman, Police Officers, Rock Climbers, Gymnasts, Musicians, and anyone else who wants to develop a strong crushing grip and muscular hands, wrists and forearms. How to add 1 inch to your forearms in just 90 days. I always had problems holding on to heavy dead lifts and shrugs. I had lots of pulling power, but I just couldn’t hold on to the bar without lifting straps. 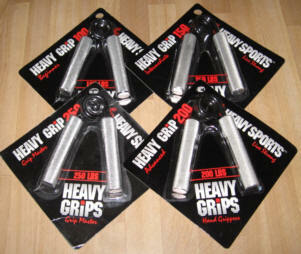 In May 2004 I ordered the full set of Heavy Grips hand grippers to strengthen my grip. When I got the grippers I could barely close the 200 lb. gripper, and could hardly budge the 250 lb. and 300 lb. grippers. But I set a goal then and there that I would close the 300 lb. gripper before the end of this year. I faithfully trained the grippers 3 times per week (after my workouts). Focusing a lot on doing heavy negatives with the harder grippers. Week by week I could see my grip improving. I moved up to closing the 250, and in July I was able to fully close the 300 lb. hand gripper! I am amazed at how fast my grip strength went up by training with the Heavy Grips hand grippers. I thought for sure it would take me a full year to be able to close the 300 lb. gripper, but I was able to achieve that goal in less then 3 months! I have also added a solid inch to my forearms during this time. Now when I do heavy dead lifts or shrugs my grip is solid and I hardly ever need to wear lifting straps as a crutch. My grip has never been this strong and it was all a result of regular training with the Heavy Grips hand grippers. 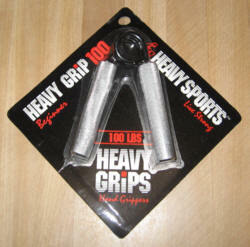 Note: Since this Heavy Grips has created a new 350 pound hand gripper. 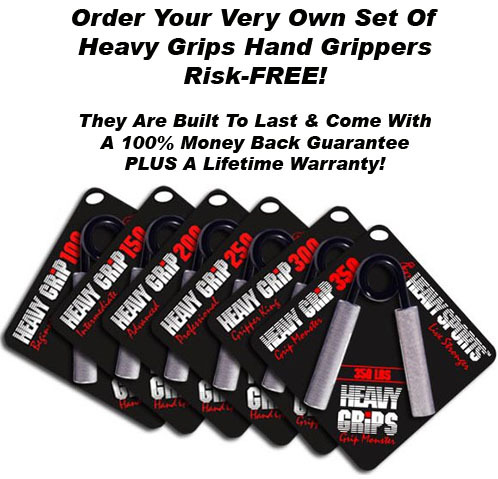 Order any Heavy Grips Hand Gripper and get Huge Freaky Forearms & The Hand Gripper Training Manual for FREE! Note: These bonus programs are PDF downloads that you’ll get right after you place your order! Special – You Save: $52.70! Just wanted to give a little testimonial on my experience with the Heavy Grip Hand Grippers. I’ve been strength training on and off for years, and used to train in MMA. I initially purchased the 200 LBS hand gripper a few months back, and was hardly able to squeeze out several reps, so I demoted myself to the 150, worked my way up to the 200, and am now squeezing out 8-10 reps on the 250 pounder after just a few months. I’ll be purchasing a 300 pounder soon enough, and then hope to graduate to the 350. Thanks for the excellent product. I was able to up the weight in my kettlebell training due to my increased grip strength. Thumbs up! I just got the 200lb hand grip today. Thanks for the super fast shipping. Boy this thing is tough! I guess I’m not as strong as I thought I was. I’m probably going to buy a 100lb one & work my way up to this one. I drive a cab all day & like to do this while I’m driving. I usually do reps of 25-30 with the cheaper plastic handle grippers. The last pair I had just snapped from over-use I guess. Anyway,thanks for your excellent service & a well built tough product. — Curtis Dennis Jr. — Bodybuilding.com author. — Chris Shugart — Testosterone Magazine. — Ken Faragher — ’96 & ’98 Canadian Arm Wrestling Champion. — Fred Roisen — Armwrestling Champion. I am 17 years old and have been weightlifting since I was 15. I first got the 150 HeavyGrip and the HG 200 when I turned 17. I closed the HG150 easily out of the box but couldn’t even close the 200 once…. Now I am using the HG200 for reps and can get the HG250 3 times!! I am currently working on the HG300 and hope to have it crushed by my 18th birthday! Thank you so much for making such a great product! I know I will continue to use these for the rest of my life! I just wanted to let you know that I received my set of Heavy Grippers (man, that was fast!) and am really impressed with both their quality and the range of strength required to close each gripper. Although I am relatively new to the grip world, I have had occasion to use other grippers and working with the HGs, I am finding that having a balanced set of grippers is allowing me to really plan my training and monitor my progress. I especially like the 50 lbs increments as I can move up gradually, and the range offered by your grippers provides me with a gripper for every need, be it higher reps, overcrushes, singles, or negatives. These babies are silky smooth and built to last, Thanks! I have your 150lb gripper and it’s awesome! I could hardly close it when I first got it now I can easily close it 20 times and am ready to step up to the 200lb gripper. I would just like to express my appreciation for your Heavy Grips products. I’ve already had one of them for 2 months now and my brother just purchased all of them as a set. They really are a great workout tool and they are very addictive. I am determined to get to the highest level of resistance! Q: Which gripper should I start with? A: The HeavyGrip(HG)100 is mostly used as a warm-up gripper or for grip beginners. We recommend this gripper for females, young athletes and people with a weak grip. It is also a very high quality gripper for stronger people who like to do a lot of repetitions. That’s why it’s called “The Beginner”. Most strong people can do reps with the HG 150 – “Intermediate” and find that the grips become really difficult at the HG 200 level and people of average hand strength have trouble closing the HG 200 for reps or the HG250 once. When training their hand like other bodyparts with reps under 20, most people are surprised at how fast they can master the HG 200 and HG250 and are ready to step up to the HG 300 or HG 350. Q: Can I exchange my gripper for a stronger or weaker gripper? “The HG150 was not as tough as I had thought” or “I’ll never be able to close the Heavygrip 350”. Don’t worry because we have a two-week no-hassle return policy, which is supposed to be for those that aren’t happy with their grippers for whatever reason. However, you are responsible for all the shipping and handling costs associated with returning your current grippers and re-sending you the new grippers. It is not our fault if you choose the wrong hand gripper. And very often it maybe just as cost efficient to simply purchase the new gripper you want rather then paying for shipping and handing on both ends. Q: How should I train with the Heavy Grippers? A: Our handgrippers are designed for building superior hand strength. To do this you must train your hand similar to any other body part and use low reps. You will not develop a super strong grip by doing a lot of repetitions. Like any other bodypart, don’t forget to warm-up and stretch your hands. Keep the reps in the range of 5 to 25. If you are able to do 15 to 25 reps with a particular strength of gripper, it is a good time to move up to the next level of gripper. Even if you aren’t able to close the next level you can do partials, forced reps and assisted negatives until you are fully able to close it. The average person has trouble being able to close the HG200 on the first try and many report after a couple of months of training they are easily closing it for reps. When you are able to close your lighter grippers for more than 25 reps, you can use them for warm-ups and for “super-sets”. An example of a “super-set” would be to use the HG250 for 2 reps, then the HG200 for 8 reps, then the HG150 until failure, then the HG100 to failure. Q: I don’t have a credit card, can I order the Heavy Grippers by mail order? 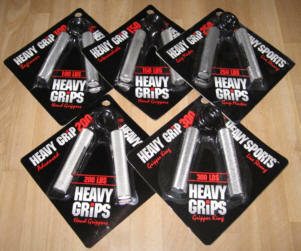 A: YES, you can order the Heavy Grips hand grippers by mail order. Just Click This Link to print off our mail order. The order instructions and address are right on the mail order form. 100% Money Back Guarantee + A Lifetime Warranty! 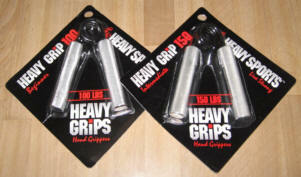 Heavy Grips hand grippers carry a Lifetime Warranty to the original purchaser. We will replace free of charge any Heavy Grips handgripper that has broken or malfunctioned through normal use. Unlike most companies, our Lifetime Warranty means a “lifetime”. If your gripper spring breaks 15 days, 15 months, or even 15 years from now, we will send you a new gripper, at no expense to you, right away. Our Online Order System Is Safe & Secure And Your Purchase Is Backed With Our 100% Satisfaction Money Back Guarantee.